Considered to be one of the top six most haunted places in America, the Queen Mary in Long Beach, California has attracted a large number of individuals due to the unexplained phenomenon and true ghost stories that have been said to have occurred here. If you are drawn to the scariest places on Earth, and you are a natural ghost hunter at heart, the massive Queen Mary, or the “Gray Ghost” as deemed by many, is sure to draw your interest and heighten your senses! Here, you will learn about the Queen Mary and her haunted history. Do you dare to visit one of the most haunted places in America? It is said that the Queen Mary currently houses a large number of poltergeists, as well as several hundred souls that lost their lives while traveling onboard this massive vessel as it sailed across the large, mysterious seas. This particular haunted ship once represented the British. This lasted for approximately thirty years. Eventually, it was purchased by an American and now serves as one of the most haunted tourist attractions in the United States. The Queen Mary has made 1,001 journeys. The very last one came to an end in Long Beach, California – where she was transitioned from a commanding ocean liner to an attraction. Initially, this most haunted ship served as a luxury liner that was notable for serving high class individuals such as political figures, actors, actresses, writers, and more. Eventually, during the struggles of WWII, The Queen Mary served military purposes. 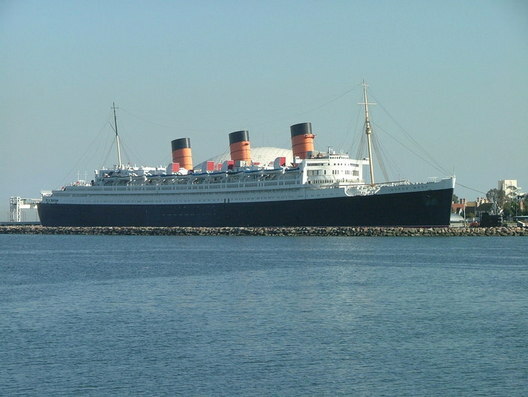 Surviving captives, and even an attempt made by the notorious Hitler to completely eliminate her, the Queen Mary survived and continued to float on. By the year of 1947, the military relinquished use of the mighty vessel and it was able to return to serving various guests. In 1967, the haunted ship was purchased by America. Today, you can visit this ship and dine in a luxury restaurant, stay in the onboard hotel, or simply learn about its history in the museum. There are several spirits that still linger in within the walls of this most haunted ship. As a matter of fact, the Queen Mary is considered to be the most haunted of all old ships still floating today. Below are some of the hauntings that have been associated with the Queen Mary making it one of the most haunted places in America today. 1. In the area of the suites that house first class individuals, there has been an apparition spotted by many different guests and employees of the Queen Mary. The apparition is a man that appears to be wearing a suit from the period of the 1930’s. 2. Many individuals who have stayed aboard the Queen Mary have observed lights turning on, and then turning off with no reasonable explanation. 3. There are a number of guests that have claimed that as they slept, the blankets and other bedding were pulled off of their body and no one was present. 4. Many have witnessed a beautiful woman in a lovely white gown dancing in the haunted ship. 5. The room B340 is a very popular place for paranormal activity. A murder occurred in this particular room and it is no longer even used because of the high level of activity in the room. Poltergeist activity screams, and more occurs in this room. There are over 600 spirits lurking in the Queen Mary. If you want to visit one of the most haunted places in America, visit Long Beach, California and visit the famous Queen Mary.